Our unique personality manifests in our relationships with others. The Supreme Person is no exception; however, His personality is unlimited. The variety of spiritual relationships one can have with Krishna, the Supreme Personality of Godhead, is the subject of Bhakti Rasamrita Sindhu, the spiritual masterpiece composed by Rupa Goswami, one of the prominent disciples of Chaitanya Mahaprabhu. 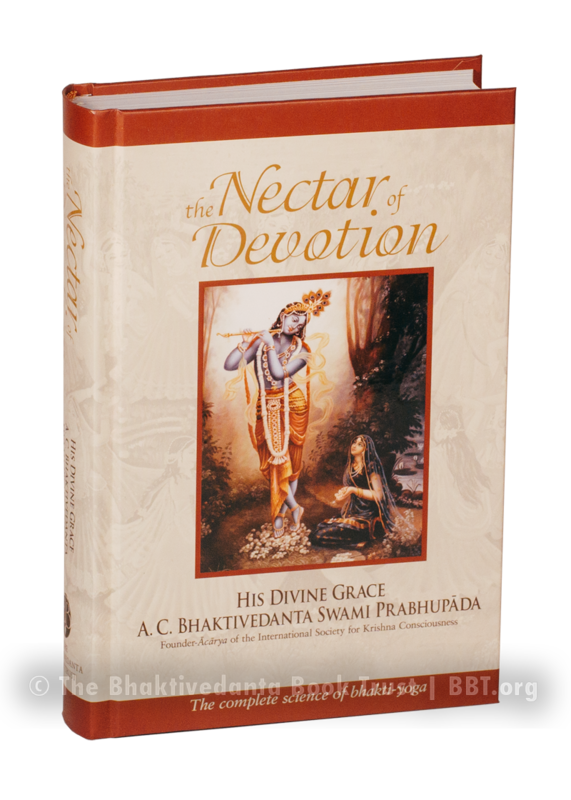 Nectar of Devotion is Srila Prabhupada's English translation and commentary on Bhakti Rasamrita Sindhu, presented in the form of a summary study. "Summary study," Prabhupada once quipped, "means I can do what I want." Srila Prabhupada published Nectar of Devotion in 1969 to clearly describe for his students the variety of relationships (rasas) one can have with Krishna and the various stages of progress one can hope to reach on the spiritual path. For those on that path, he also wished to caution of the many pitfalls to be avoided. Of all the books Srila Prabhupada translated and commented on, Nectar of Devotion gives the most clear and concise presentation of the specific practices of Krishna consciousness. He subtitled Nectar of Devotion "The Complete Science Of Bhakti-Yoga," to stress the scientific nature of Krishna conscious practice. The bhakti-yoga practitioner regularly employs observation and experiment, not in Petri dishes or using electron microscopes, but on his own state of consciousness. Bhakti-yoga's ultimate goal is pure love for the Supreme Person, minus any selfishness or agenda other than unceasing devotional service. To achieve that goal—as in any scientific experiment—there are things one should do and things one should not do. Citing many, many case studies found in Vedic writings, as well as lists of principles to be observed and symptoms by which to evaluate ones progress, Nectar of Devotion guides the reader from the very beginnings of sadhana-bhakti—devotional service in practice—all the way to the highest limits of prema-bhakti, spontaneous devotional service in pure love of God.